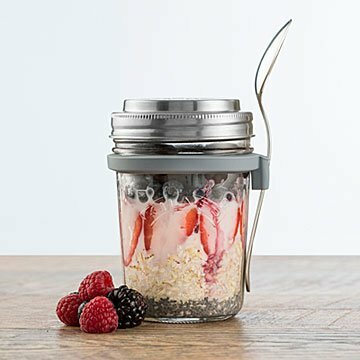 Your healthy overnight oats habit deserves a convenient container that preps, chills, carries, and serves. Healthy, tasty, and convenient, overnight oats are a Thing, and deservedly so. We think they deserve their own dedicated container—a mason jar (of course). Put in your oats and milk, chill overnight, fill with yummy fruit, nuts, and seeds the next morning, and bring it to work. The stainless steel lid (canning style, so it seals airtight) doubles as a ½ cup measure for easy prep and portioning. The silicone ring around the top has a slot to hold the included spoon. When your overnight oats-eating coworkers see your setup, they're going to want one—and boom, it'll be a Thing, too. Made in China. 5.2" H x 3.5" Dia. Dishwasher safe. Do not pour boiling water directly into jar. Wash before first use. I want to get a couple more for make ahead breakfasts! The breakfast jar is so simple to use. I like that I can make my oatmeal the night before and take it out in the morning and have no prep. It's a great morning timesaver!